As a result of the destruction wrought during World War II, the necessary large-scale re-building of London provided city planners with an unparalleled opportunity for remodelling. Following the end of The Blitz, various planners had put forward their regenerative proposals, the most notable of whom was probably Patrick Abercrombie. He saw the need for a balance between industrial applications, green spaces and social housing, as seen in the post-war developments of Brixton's Loughborough Estate and the Lansbury Estate in the Poplar area, and strongly featured the concept of 'high rise' tower block communities as a solution to the provision of accommodation for an expanding population. The concept of a 'Green Belt' was also clearly defined in his 'County of London Plan', which he envisaged as being a band of farmland, parks and recreation areas that would encircle the capital and be subject to a much stricter regulation of construction and development than previously. As a counterbalance, to provide for expected expansion, Abercrombie's plan also proposed the creation of a number of 'New Towns' around the capital, outside of the 'Green Belt'. In 1945 Lord Reith of Stonehaven was appointed as chairman of the government-sponsored 'New Towns Committee' that concurred with Abercrombie's vision, leading to The New Towns Act 1946 that allowed the government to designate areas as new towns and pass control of the development functions to a Development Corporation. In the following years, eight areas were designated as 'New Towns', undergoing large-scale expansion and redevelopment. These were: Basildon (Essex), Bracknell (Berks), Harlow (Essex), Hatfield (Herts), Hemel Hempstead (Herts), Letchworth Garden City (Herts), Stevenage (Herts) and Welwyn Garden City (Herts). The Act was replaced by the New Towns Act 1965 and, later, the New Towns Act 1981. The first 10-storey building containing council housing opened in Holborn during May 1949 and, by the Sixties, more than half a million new flats had been built, a great many of them as 'high rise' tower blocks. The Corporation of London had to deal with the reconstruction of the inner city, particularly the area between Aldersgate and Moorgate that had been destroyed in a single night's bombing on 29th December 1940, and came up with The Barbican, designed to incorporate water gardens, housing and a school as well as office blocks, a city museum and an arts centre. Chamberlin Powell and Bon were probably responsible for redesigning more of post-WWII London than any other architectural practice as they were responsible for The Barbican Estate and the Golden Lane Estate. The Barbican was a major undertaking and, at the time, was Europe's largest reconstruction project, although not exactly 'social housing'. The new facilities were officially opened in 1969 but weren't fully completed until 1976. The estate contains three of London's tallest residential towers, at 42 storeys and 404 ft. 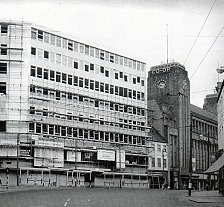 These are: Cromwell Tower, completed in 1973; Lauderdale Tower, completed in 1974 and Shakespeare Tower, completed in 1976. Love it or loathe it, there is no doubt that the high rise, high density crusade for function and form that was Sixties architecture made a significant impression on the post-war British skyline and landscape. The style of architecture that we generally associate with the Sixties was actually a later extension of the Bauhaus-inspired 'modernist' movement of three decades earlier. The original architectural mainstay of this movement was not British, but a Swiss architect named Charles-Edouard Jeanneret, better known in the design world simply as 'Le Corbusier', who was also known as a painter, writer, sculptor, furniture designer and urban planner. Due to the accelerating spread in land use and city redevelopment, urban planning became much more structured during the 20th century and the 1933 meeting of the Congrès Internationaux d'Architecture Moderne (CIAM) established what eventually became the Athens Charter, which laid down the basic concepts and shaped the large majority of urban planning practices for the Fifties and Sixties. 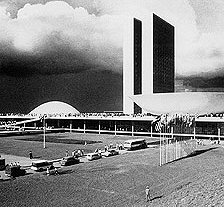 The ultimate realisation of this was seen in the latter part of the 1950s when a completely new capital city was built in Brazil, called Brasilia, a futuristic development planned and developed in 1956 with Lúcio Costa as the principal urban planner, Oscar Niemeyer as the principal architect and Roberto Burle Marx as the landscape designer. The city with its airplane-like shape was inaugurated in April 1960. The regeneration of war-damaged Britain required fast, simple, comparatively cheap construction and was a major factor in driving the advancement of building material technology and design, particularly in the use of 'new' materials such as aluminium. The demand for rapid building of smaller structures during the war and 'temporary' new housing immediately afterwards resulted in many forms of smaller prefabricated building such as the semi-circular metal Nissen hut of earlier years which had evolved into the Quonset hut, but the need to build bigger, more permanent structures pushed designers into 'modular' thinking - reproducible building elements in cheap, readily available materials, such as concrete, that could be mass-produced and assembled into structures in a number of different ways, usually relying on some form of steel 'skeleton' to support them. An alternative method, as used in Ronan Point, was known as LPS (Large Panel System) building and involved casting large concrete prefabricated sections off-site then bolting them together to create the building. These forms of construction, originally conceived in 'The Lawn' (the first residential tower block in the UK constructed in Harlow, Essex in 1951) fulfilled the need to provide mass housing on limited land areas in inner cities. The style of design pioneered by Le Corbusier, now generally known as 'Brutalist' (the term being coined by English architects Alison and Peter Smithson in 1953, from the French 'béton brut' or 'raw concrete', a phrase used by Le Corbusier in describing the poured textured concrete with which he constructed many of his buildings), flourished from the 1950s to the mid-1970s and contrary to previous design created simplistic, unadorned, monolithic concrete structures built around a steel frame. The name became more widely accepted after British architectural critic Reyner Banham used it in the title of his 1966 book, 'The New Brutalism: Ethic or Aesthetic?' Brutalist constructions usually exhibit striking and repetitive angular geometries, often textured with wooden forms from the moulds used in the on-site casting of concrete. 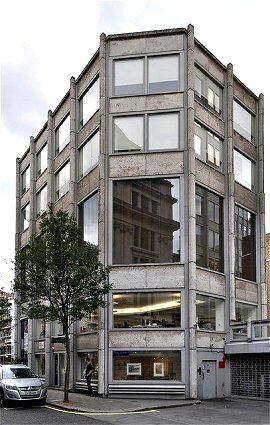 Although concrete is the material most widely associated with the style, its use is not necessary for a building to be considered as Brutalist architecture. Building materials also included aluminium, glass, steel, rough-hewn stone and gabions. Many of Alison and Peter Smithson's designs are built from brick. 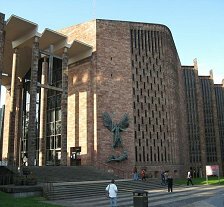 On the other hand, just because the main construction material was concrete, the design style was not necessarily Brutalist, but could have been one of any of a range of popular post-war styles such as Constructivism, Expressionism, International, Deconstructivism or Postmodernist. 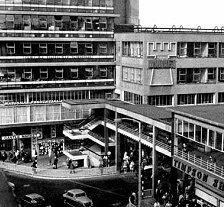 The style grew in popularity as inexpensive construction and design methods for low-cost housing, shopping centres and office buildings were pursued. However, many large budget construction projects also embraced the style as it had certain 'futuristic' qualities. Nonetheless, many architects chose the Brutalist style even when they had large budgets. 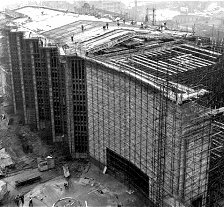 Britain was establishing its own 'modernist' architects and designers, such as Sir Basil Spence, the designer of Coventry Cathedral, Owen Luder and his 'Tricorn' shopping centre and Alison and Peter Smithson who created London's 'Economist' building and 'Robin Hood Gardens', Richard Seifert, John Bancroft and Sir Denys Lasdun. Foreign architects such as 'Trellick Tower' designer Hungarian Erno Goldfinger were also making their mark. 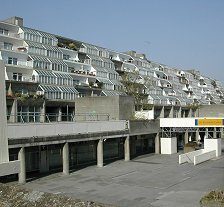 There were construction triumphs such as the Post Office Tower as well as planning disasters like Westgate House, Newcastle, but the public housing projects influenced by Le Corbusier are now considered to be largely responsible for having the effect of isolating communities in high-rises and disrupting the traditional social ties integral to community development. As cities underwent massive rebuilding programmes entire communities were split up and re-housed in anonymous, sometimes badly-constructed (see 'Ronan Point') grey boxes, even if they didn't want to go. There were, not unusually, no suitably supervisable play areas for children and ineffective lift maintenance often resulted in residents having to climb up and down dozens of flights of stairs on a regular basis. Richard Seifert's commercial building designs have made a major contribution to London's skyline with Centre Point (and later the NatWest Tower - now called Tower 42), which was completed in 1964 at a cost of £5.5 million. 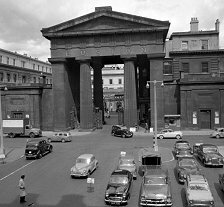 This was to be one of the most controversial building projects ever seen in London and was in a planning stage as early as 1956 when London County Council decided that it wanted to build a roundabout at the junction and modernise the surrounding area but couldn't afford to buy the land. A developer called Harry Hyams offered to buy the land for the roundabout if the LCC agreed to provide him with planning permission to build around and over it. 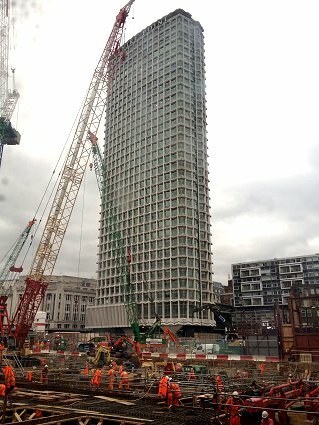 What turned out to be an illegal agreement resulted in Centre Point being constructed but remaining empty for many years after its completion. Hyams realised that, by keeping it empty, he could avoid having to pay business rates on the building while the capital appreciation of the property value was far in excess of any lost rental income. 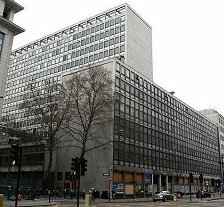 The building was first advertised as being available to rent in 1973, by which time its estimated value had grown to £20 million, making it the most profitable building venture ever in London. 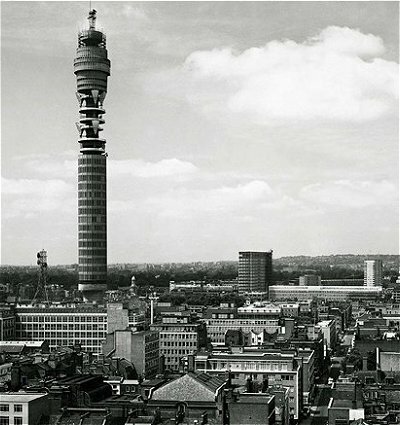 The NatWest Tower was the tallest building in the City of London for a long time. 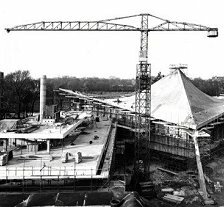 Designed by Seifert and engineered by Pell Frischmann, it was built by John Mowlem & Co between 1971 and 1980, being formally opened on 11th June 1981 by Queen Elizabeth II. 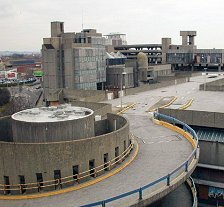 The Tricorn Centre was probably one of the most dramatic Brutalist style projects, a shopping and car park complex in Portsmouth, Hampshire, designed by Owen Luder and Rodney Gordon, taking its name from its similarity in shape to the hat of the same name. 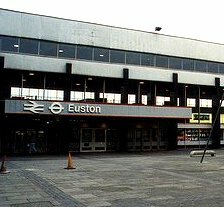 It was a classic example of the Brutalist genre and had the dubious honour of being voted the 3rd ugliest building in the UK before its eventual demolition in 2004. 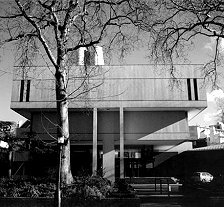 Architect Sir Denys Louis Lasdun contributed the bold and dramatic designs of many buildings, including the National Theatre, Keeling House and the Royal College of Physicians, to the London of the late Fifties and Sixties. 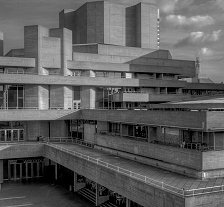 His best-known design is probably the Royal National Theatre on London's South Bank and a notable example of the Brutalist style of design. Also on the South Bank is The Queen Elizabeth Hall, standing alongside the Royal Festival Hall which was built for the Festival of Britain of 1951. 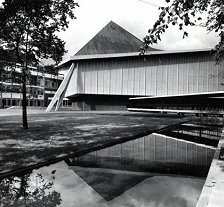 Two auditoriums, the Queen Elizabeth Hall and The Purcell Room were designed as additions to the Southbank Centre arts complex by Hubert Bennett, head of the architects department of the GLC, with Jack Whittle, F.G West and Geoffrey Horsefall and opened in March 1967, followed by The Hayward in October 1968. Philip Powell RA and Jacko Moya gained widespread acclaim when they won a competition for their Modernist design of the Churchill Gardens housing estate in Pimlico. Their later works include the Museum of London and the Queen Elizabeth II Conference Centre. Due to the London County Council's construction height restrictions, Patrick Hodgkinson's brief was to convert an area of run-down terraced housing into a construction project that achieved the same density as two tower blocks without exceeding the 80 ft height limit. His solution was to create a design that put the housing in two rows with a shopping centre in the middle and two levels of underground car parking. The design of The Brunswick, started in 1959, was his concept of a 'London village' but didn't turn out quite that way. By 1964 the Labour government had passed laws requiring evicted tenants to be compensated, making the scheme financially unviable. 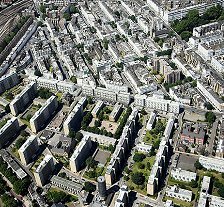 A compromise was reached and construction went ahead, finally being completed in 1972, but was considerably different in content from the original concept and metamorphosed into a 'council housing ghetto'. 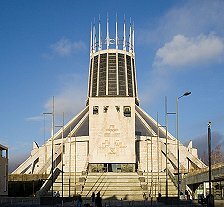 Sir Frederick Gibberd's design for the fourth and newest Liverpool Metropolitan Cathedral was chosen out of more than 300 entries from all over the world. 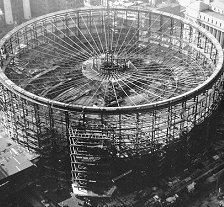 Building began in October 1962 with Pathé newsreels covering the various stages of the building process. It was completed less than five years later on the Feast of Pentecost, 14th May 1967. 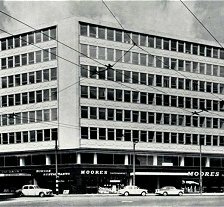 The Fleet Building was a huge 11-storey telecommunications centre, designed by W.S. 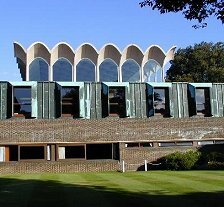 Frost with guidance from Eric Bedford, chief architect of the Ministry of Works, and was completed in 1960. Situated on a large site between Shoe Lane and Farringdon Street it is currently the subject of redevelopment plans. 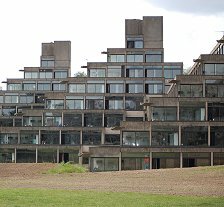 Alison and Peter Smithson's iconic designs include the Economist Building (59-65), the Garden Building at St Hilda's College, Oxford (68) and the highly controversial Robin Hood Gardens estate (69-72). 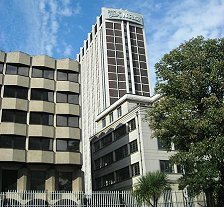 The 79-metre tall St. George's House (better known as the Nestlé Tower) was completed in Croydon in 1964 to house the Swiss food company. It was designed by architects Ronald Ward and Partners, who also designed the Millbank Tower (originally known as Vickers Tower) in 1963. Ronan Point, named after Harry Louis Ronan (a former Chairman of the Housing Committee of the London Borough of Newham), was part of the wave of tower blocks built in the 1960s as cheap, affordable prefabricated housing for inhabitants of the West Ham region of London. The 22-storey tower was built by Taylor Woodrow Anglian, Construction started in 1966 and was completed on 11 March 1968. 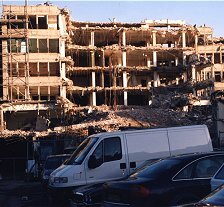 However, it partly collapsed shortly afterwards on 16 May 1968 when a gas explosion demolished a load-bearing wall, causing the collapse of one entire corner of the building. Four people were killed in the incident, and 17 were injured. Although partially rebuilt with strengthened joints (and gas supplies removed!) 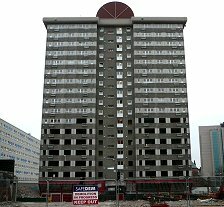 , this incident led to a general public mistrust of current tower block construction and major changes in building regulations, the first of which came with the 5th Amendment to the Building Regulations in 1970. 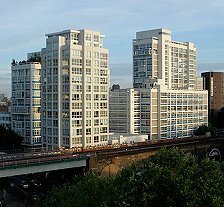 All nine tower blocks on the estate, containing 990 flats, including Ronan Point, were demolished in 1986 to make way for a new development of low-rise housing. Hungarian-born architect Erno Goldfinger owned a house in Hampstead, London, adjacent to James Bond author Ian Fleming, who took a dislike to Erno's design style and destruction of Victorian architecture so much that he named the famous Bond villain after him! Curiously, Goldfinger was later responsible for designing Alexander Fleming House (now Metro Central Heights), one of London's iconic buildings, completed in 1966. 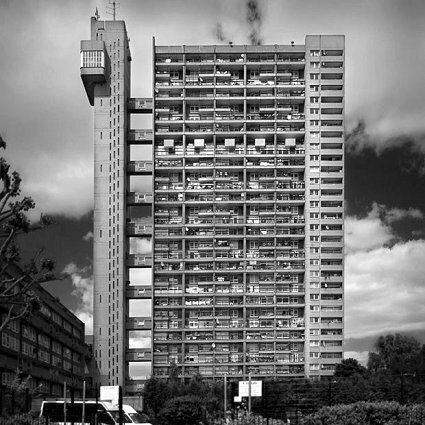 Other Erno Goldfinger designs of the Sixties and early Seventies included the Balfron and Trellick Towers and Carradale and Glenkerry Houses. 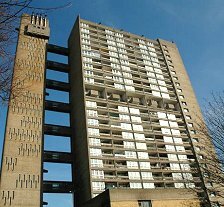 The 27-storey Balfron Tower was an earlier and slightly shorter version of the 31-storey Trellick Tower. Carradale House and Glenkerry House are on the same Brownfield Estate. In Northern Ireland, the somewhat infamous Divis flats complex in west Belfast was built between 1968 and 1972 and was demolished in the early 1990s. Divis Tower, built separately in 1966, still stands, and the former British Army base on the top two floors has been converted into new dwellings. The vehicular equivalent of tower blocks - multi-storey car parks - were constructed to address the increasing problem of town centre parking and by-passes were constructed around towns and cities to try and reduce traffic jams. 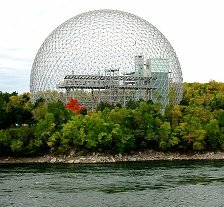 Further afield, outside of the UK, Richard Buckminster "Bucky" Fuller was an American architect, inventor and futurist who developed the construction method known as the geodesic dome, the best-known example of which was the Montreal Biosphere at Expo 67. 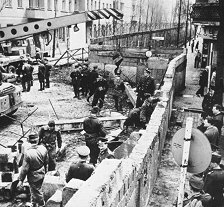 August 13th 1961 saw the beginning of the construction of the Berlin Wall, which was completed after just 18 days. 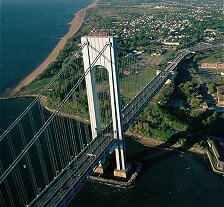 The Verrazano Narrows bridge was opened in New York in 1964. Its centre span of 4,260 feet made it the longest suspension bridge in the world until it was surpassed by the UK's Humber Bridge in 1981. The 7.2 mile Mont Blanc Tunnel road tunnel under the Mont Blanc mountain in the Alps was started in 1957 and completed in 1965, linking Chamonix, France with the Aosta Valley in Italy. The Salazar Bridge in Lisbon, Portugal was inaugurated on August 6th 1966. A suspension bridge, with 'international orange' colouring, it was often compared to the 'Golden Gate' Bridge in San Francisco, USA, and it is not surprising to find out that it was actually built by the American Bridge Company, the same company that constructed the San Francisco - Oakland Bay Bridge. 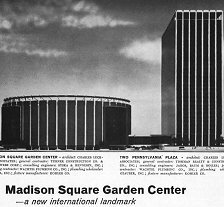 Madison Square Garden, the multi-purpose indoor arena situated on top of the Pennsylvania Station in New York was opened on February 11th 1968 and was the fourth building to bear the name. Constructed by R.E. McKee of El Paso, Texas, it was one of the first buildings to be constructed above an active railroad system. 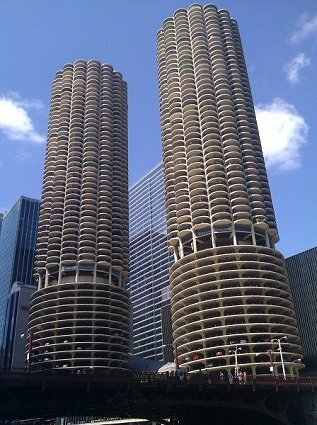 The Marina City complex in the USA was designed in 1959 by architect Bertrand Goldberg. Completed in 1964, at a cost of $36 million, it is notable for being the first building in the United States to be constructed with tower cranes. The Fernsehturm (television tower) in Germany was constructed between August 4th 1965 and transmitted its first signals on October 3rd 1969, being officially inaugurated four days later. It was conceived by the former German Democratic Republic who intended it to be not only a telecommunications tower but a symbol of post-war Berlin. The original total height of the tower was 365 metres, since extended further by the addition of aerials, makes it still the highest structure in Germany and the fourth tallest free-standing structure in Europe. With the increase in road vehicles, bigger and better motorways were on the increase as well. As far back as 1905 proposals had been made for a London 'orbital road'. The 1944 Abercrombie report for the regeneration of London actually recommended five ring roads, of which just the North Circular and the M25, which was a combination of two, have been subsequently built. The M25 is the longest city 'bypass' in the world at a length of 117 miles, its distance from Charing Cross varying from 13 to 22 miles. The final section was opened by Prime Minister Margaret Thatcher in 1986, by which time its total cost was close to £1,000 million. Two major new road bridges were also opened in Scotland - the Forth Road Bridge (right) in 1964 and the Tay Bridge in 1966 - popularly shortening journey distances but disliked for the toll charges to use them. In the late sixties a motorway was planned as an extension to the A40 as a three-lane elevated road beginning at White City, cutting through North Kensington and Paddington to join up with the Marylebone Road heading into the City. An additional 'spur' road was planned going Northwards to join up with the M1. There was massive opposition to this that carried on into the initial construction phase, due to the potential destruction of the St. Quintin Estate and the route was eventually changed, with the plan for the spur road eventually being completely abandoned. The foundations for the spur had already been laid and can still be seen on the roundabout at the Wood Lane junction. Motorway service stations were almost a class of architecture and culture all by themselves. 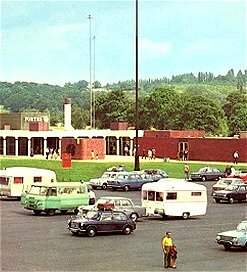 The first service station, Watford Gap on the M1, sold sandwiches out of hastily erected sheds from the first day the M1 opened. Newport Pagnell opened on 15th August 1960 under the name 'Motorway Services Ltd', a joint venture between Forte and Blue Star. The original idea was for Watford Gap to cater for lorries and Newport Pagnell for cars, but that never actually happened for several reasons. Fortes opened the facility in 1960 under strict instructions to make it 'uninteresting' and to mask it from the road with tree planting. When the Government made their final inspection they found that both criteria had been completely ignored, but the services opened anyway. 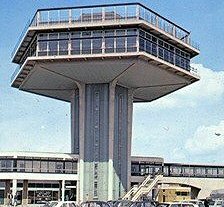 The highlight of Forton was its hexagonal tower, which resembled an airport control tower.